The Clarks Stomp Claw are cool boys shoes that roar with style. These shoes feature velcro fastenings that enable them to be put on quickly and remain secure throughout wear. The Clarks Stomp Claw have a dinosaur theme that make them a fun and unique choice for boys but it remains subtle enough for everyday wear. 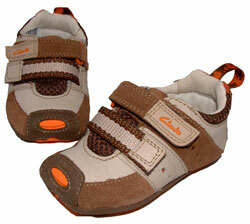 These shoes have a robust rubber sole that make them ideal for the playground and outdoor expeditions.